It was an intriguing undertaking from the very beginning: Take 27 holes of classic parkland golf that had grown long in the tooth. And turn it into 18 holes of modern golf. If done right, the result of the $16.8 million project would be a fine new golf course that reduced the threat of Salt Creek flooding issues. The Preserve at Oak Meadows was done right. It’s very playable for those who stay on the appropriate tees. Located in Addison, Illinois, near Chicago’s O’Hare airport, it has retained the woodland feel of its previous incarnation in many places. In addition, the extensive tree clearing also has created gorgeous prairie vistas. That might be the most interesting part of the whole project, a Greg Martin design: The new Preserve at Oak Meadows, which formally opens its preview season on Aug. 7, is a visually enchanting journey. Where old-growth trees mundanely once stood, the new routing wends through a beautiful array of wild flowers, marshes and shrubbery. The remaining trees, and there are many, are enhanced, not diminished by the pruning of the forest. And the project actually added 500 native trees and more than 300,00 native wetland plants that give the course a real Prairie State feel. 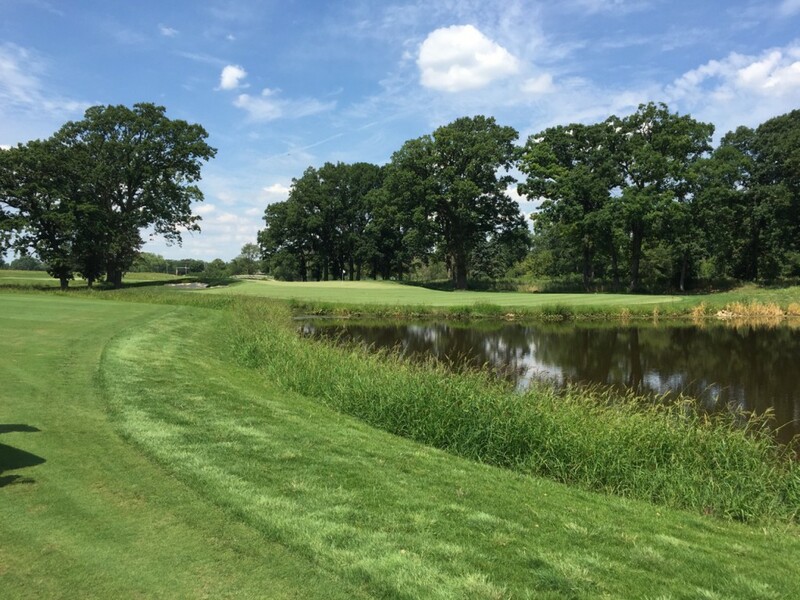 There will be many moments of familiarity for those who knew Oak Meadows, the former Elmhurst Country Club, a vintage layout where a young Ben Hogan won the 1941 Chicago Open. The first, second (which is now No. 6) and 18th holes, which occupy the same ground, may seem the same. But they have undergone important changes. The fairways are completely replanted, and much more likely to run fast and firm. The No. 1 and No. 18 greens are much larger, and the slope on No. 2 is much subtler. All of the greens promise to roll quick, and many of them have prominent contours. Where the old greens tended to be flat, the new greens demand carefully placed approach shots from players who plan to score well. Other vestiges of the old course abound. No. 10 and No. 17, which were short par-fours, have been turned into interesting par-threes. Another short par-four, No. 16, has a similar feel to the old No. 15, which covers the same fairway and.green ground. Moving the tee box away from the trees, and over a wetland, was an excellent change. That’s even more true because the new green, which rises high above the fairway and features a daunting bunker, was nicely done. The old fourth hole, also a short par-four, has received a similarly effective makeover. It now is No. 7. The old 12th hole, which is now No. 15, might have undergone the most dramatic transformation of holes that seem familiar. The tee shot on this par-five, which doglegs left, looks about the same. But when you turn the corner, the Salt Creek cuts across the fairway where there merely used to be an often-flooded lowland. An even bigger change, though, comes around the well-bunkered green. The multi-bunkered left side is a sand trap in every sense of the words. The 15th is especially daunting for those who haven’t gone long enough off the tee to clear the creek on their second shot. Even with a well-placed layup, the third shot over the creek requires care and strategy. 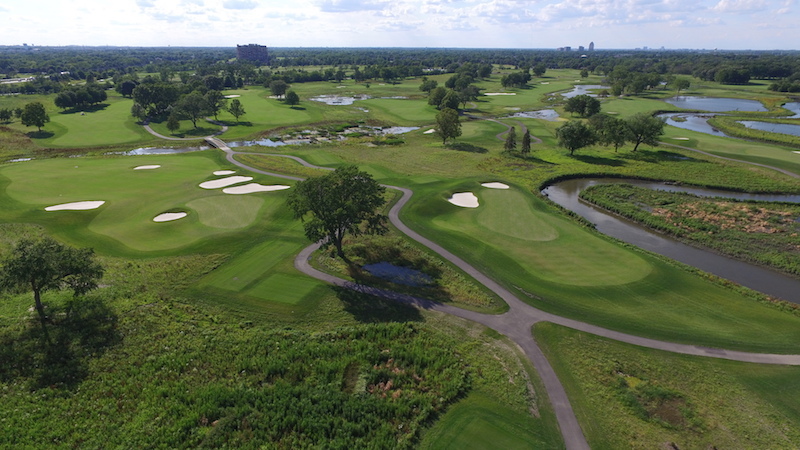 As a bogey golfer who doesn’t hit it very far, one concern I had about the new Preserve at Oak Meadows was whether it would allow me to keep playing there comfortably. The answer is yes, if it’s played from the proper tee box. At 5,700 yards, the white tees might seem short. (The blues are a very manageable and fair 6,213 yards.) But the new Preserve is not about length. With only 15 percent of the 288 acres dedicated to fairways, greens and tee boxes, it’s important to keep the ball out of the natural areas. Another big plus: While the wetlands and the creek can look imposing from many of the tee boxes, especially the first three par-threes, the forced carries aren’t as forced as they seem visually. It’s a clever design feature. After playing the course once or twice, golfers will be able to see where to miss. Oh, and some of the truly new holes are strategic delights. The new No. 2 is a fun par-five that favors a draw off the tee, and requires careful planning by fade hitters. Likewise, the second shot needs to stay left for added room, or risk a watery punishment. The short par-four fourth (302 yards from the blue tees) is a dogleg left over bunkers that will tempt long hitters. Play it to the right, though, for a short-iron approach that removes the left-side peril. And the par-five 13th, which is reminiscent of the old par-five sixth because it covers similar ground, also features some interesting risk-reward options. One of the best by-products of the new Oak Meadows is the variety of holes. The old course often seemed like an endless procession of par-fours that weren’t all that different. That is no longer a problem. 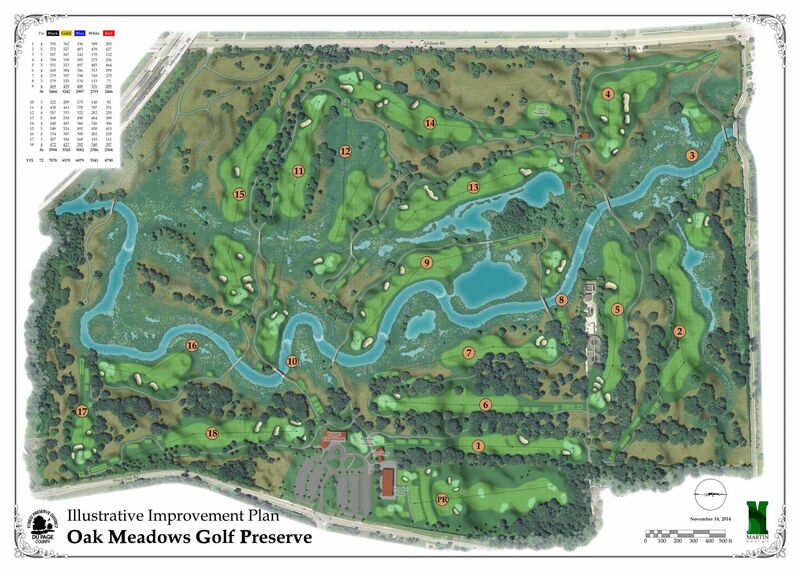 Yes, the new Preserve will gobble up mis-hits at a much higher rate than the old Oak Meadows. But with decent ball-striking from the right tee, there are actually far more holes where the green is reachable for players who are distance-challenged. In addition, the plan is to keep the Presever at Oak Meadows reasonably priced. There will be the usual premium on weekend mornings, but a variety of the usual DuPage County discounts also will be in place during the week, including the price break for walkers. That’s another plus: The Preserve is very walkable. In short, whether you think of its as a new course or a renovation, the Preserve at Oak Meadows is a winner.